Happy Valentine’s Day from the comic with the most hearts! But for now, let’s commence with the Valentine’s theme as I reflect on the love of my life that is second only to comics in its endurance…video games! “Videogames” by Dave RomanAll the characters in Astronaut Academy have multiple hearts, because I imagine that future science and bioengineering will take its cues from the video games of today! As long as we have multiple hearts in our bodies, we can survive any physical or emotional attack. Like most people my age or younger, I’ve had a lifelong love affair with video games. My passion is not just for the game themselves but for the systems, accessories, packaging, and emotional experiences surrounding them. I’ll never forget the first time I held an NES cartridge in my hand. 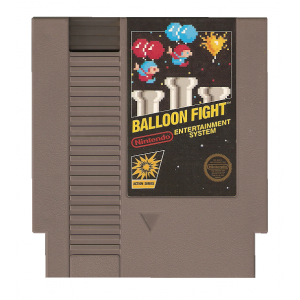 My fourth grade teacher had confiscated a copy of Balloon Fight from a kid in class, but he let me take a look at it. I was so fascinated by the unique shape, the indent for your thumb, and all those random ridges. The fact that the cartridge was so much bigger than an Atari or Intellivision game, and came with its own black plastic slipcase (it might as well have been leather). It all seemed so advanced and hi-tech. And that golden Nintendo seal of quality…so fancy! Eventually, my parents got my sister and I a NES for Christmas, and we could not play it enough. Unlike most of my friends, I only had the basic unit that came with Super Mario Bros., but no light gun or Duck Hunt (and definitely no R.O.B). But I never complained, because my parents did get me Rad Racer, and I was so happy to officially join the Nintendo generation! A few nights later I had to sleep over at my cousins’ house and wasn’t allowed to bring the whole system, so I just brought one of the controllers. I happily just pressed the buttons and pretended to be playing a game, even as I was in bed drifting off to dreamland. I seriously loved the way the buttons felt, and still smile thinking back on it all now. We really got our money’s worth out of each and every game that came into our house. I remember playing each game for hours on end, no matter how impossibly hard or sadistically cruel the level design. We just kept at it, because who knew when we’d get a new game? Eventually our local video store started renting games, and it was like the Berlin Wall coming down when we suddenly had access to all the other NES out there. I’d happily stand around in the video game aisle for hours, just looking the boxes over. I think I loved the packaging as much as the games themselves! I get crazy nostalgic thinking about the logos, icons, and photos with rounded edges on the back of those boxes. 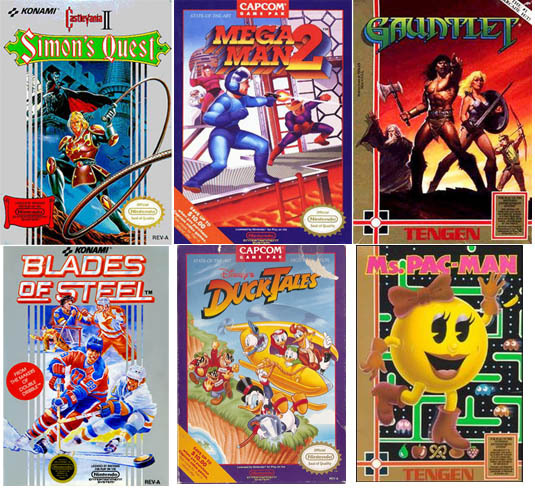 Even as a kid, I was conscious of the different approaches companies like Konami (gray frames) or Capcom (purple frames) brought to their graphic design, and thought it was insane when the box for Super Mario Bros. 2 had a full-bleed, illustrated image instead of their usual black or silver-framed covers with 8-bit character art. I actually kept all my NES cardboard boxes, and hung them on my wall so it would look like the video game aisle of a store! And of course, I subscribed to the free Nintendo newsletter that was a predecessor to Nintendo Power, and drew my own maps for games like Legend of Zelda (gold cartridge being the coolest thing ever). I’d pour over the little instruction manuals and question the choices of the illustrations and how the artists interpreted the 8-bit sprite heroes. 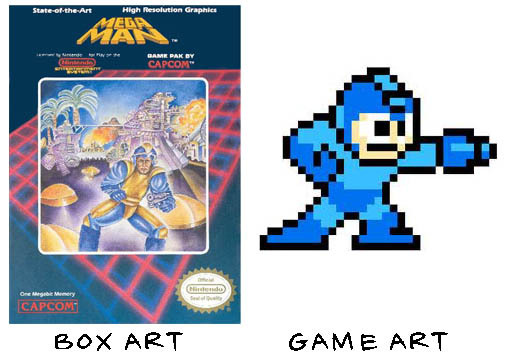 Nothing drove me crazier than games like Mega Man, where the characters on the box looked nothing like the games themselves. And before I even knew what anime or manga was, I realized that the art that was drawn in that style was closer to the spirit of the games than the airbrushed American reinterpretations. 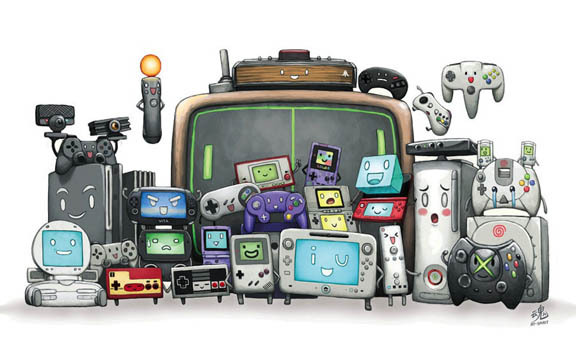 My entry to the world of video games actually began with the Atari 2600, and continued on with a quite an array of video game systems over the years. Between my sister and I, we had (in order): Atari 2600, Commodore 64 (technically a computer that we only used for gaming), Nintendo Entertainment System, Sega Master System, Game Boy, Genesis, Game Gear, Sega Saturn, Game Boy Color, Super Nintendo, PlayStation, Dreamcast, Game Boy Advance, Nintendo 64, Genesis 3, GameCube, Game Boy Micro, PlayStation 2, and X-Box 360. And the key thing is, I never threw out or traded any of these game systems or accompanying games. 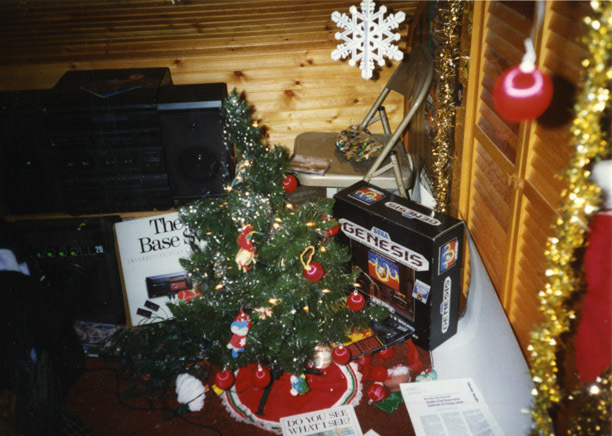 In addition to the game boxes (which, in the case of Sega, I really appreciated that they came in longer-lasting plastic cases), I’d also save the boxes for the game systems in my closet and take them out at Christmastime as decorations that would go under the small Christmas tree in my bedroom. This would help me reflect on the games I already had and loved and get me excited about the new ones that would be joining the family soon. Was I a hoarder? Possibly! My love of video games definitely borders on addiction, because eventually it got to the point where I bought lots of games I never even opened, let alone played. Getting a full-time job and self-publishing comics on the side left me with increasingly little time for hobbies. Plus, video games kept getting more complex and intimidating. It seemed like I never made it past the tutorial! I couldn’t jump in and play a quick level like I used to with Sonic the Hedgehog or Crazy Taxi. But I was still totally in love with the art and creativity connected to video games. I’d buy copies of games like Katamari Damacy and Okage Shadow King just for the aesthetics, even though my PlayStation 2 stopped working. They just looked so cool I felt like I had to own them! 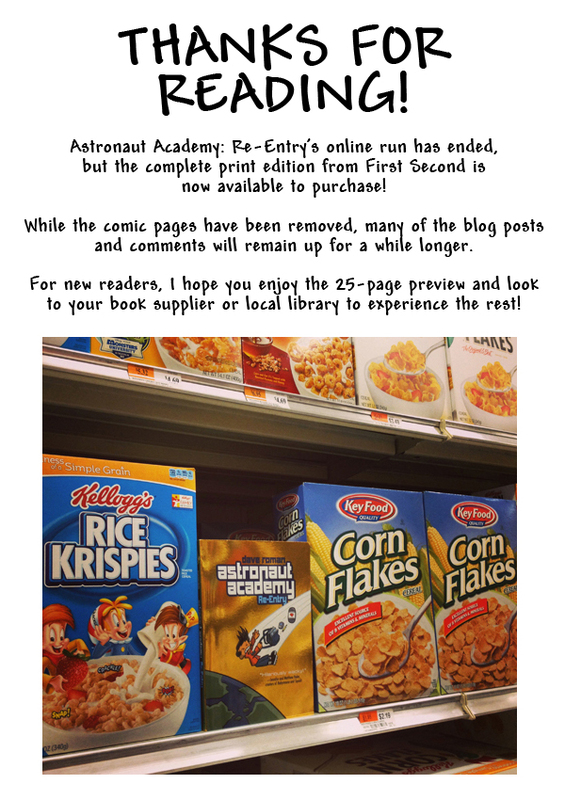 Even though I don’t get to play video games as much as I used to, they still continue to inspire my comics work, especially in Astronaut Academy. 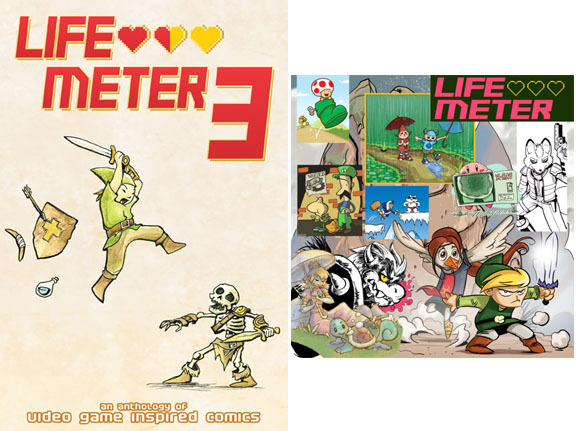 A few years ago some friends (including Zack, who I mentioned earlier) and I started the Life Meter Comics anthology as a way of combining our love of video games and sequential art in a more overt way. I could go on forever, but I’ll wrap up this blog entry for now with a plan to write future entries, about some specific games I love or think deserve more appreciation. So check back soon! I love this drawing by Ry-Spirit on Deviant Art! I remember the first console we had… the Mattel Intelevision! Most of my friends had Atari, and that’s what we wanted… but still, ours had more buttons and also thanks to the Dungeons & Dragons game we got to know about the role palying game! Through my entire life I grew up with nintendo. I had the NES, 3 super nintendos, 3 n64 (one of them is the pikachu edition) consoles, a gamecube, a wii, a gameboy, a gameboy pocket (ice blue edition), gameboy color (pikachu edition), 6 gameboy advance sp consoles, a ds, 3 ds lites, a dsi, an unopened-since-may-2012 3ds (which will be given to my little brother, since today’s his birthday), and over 100 games in total. I only have one rated M game, and that would be Conker’s Bad Fur Day for the n64, which I’ve had since I was 5, and violence was one thing I didn’t know, so all the inappropriate stuff (guns, explicit cutscenes, etc.) was something I either don’t remember or don’t understand. But I now that I’m in high school, I wanna get out of the nintendo life (except pokemon, which I also grew up with and having the most games of that relation) and try something more…modern. Which is why I’m saving up for a psp vita in hopes of it leading me to a new start, also, I’ve heard many good things about it.